Before you hit the road, we help you to put together your itinerary and book you the right car (manual, automatic, wagon, van), hotels meeting your taste and budget, local guides and any other services you have requested. Advantages: complete privacy and freedom; for three people the costs should be lower than travelling by train. Comments: Polish or international driving license usually required. A very popular choice. Hire your own personal driver and vehicle (A/C limousines, compact cars, minibuses or coaches). Our drivers speak very good English and are Poland enthusiasts. They are great company, able to tell you more about Poland and the places you are visiting. The drivers provide practical help including porterage and will share with you special finds (e.g. cafés and restaurants). They also respect your need for time on your own. Advantages: More fun, insight and security; navigation assured & someone to help. Comments: Personal drivers generally cannot replace a great local guide. 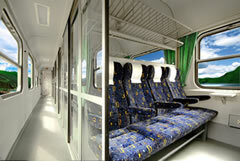 Intercity trains are quite a comfortable way of traveling between the main Polish cities. The railway stations are located near the historical districts, so it is not too difficult to get to the central hotels by taxi. Advantages: If you do not want to drive, rail is a quick and cheap travel option. Comments: Trains do not reach everywhere, and your schedule will be dependant on the timetable. Consider local guides or chauffeur-guides if you need to go further. Learn more about transport service costs and our pricing policy. Download e-books to plan your itinerary. Check our favourite road and railway itineraries. The FAQ and glossary have a full explanation of the meanings of the terms used here.